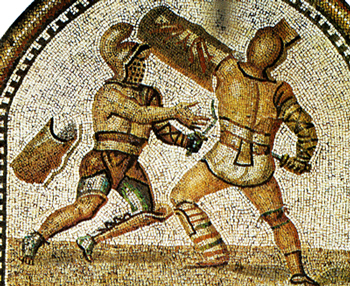 One of the most famous types of Roman art is the mosaic. 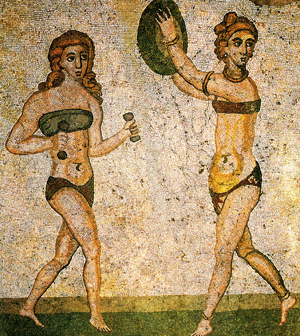 The Romans borrowed the art of mosaic making from the Greeks, although the first people to make mosaics were from Mesopotamia (now Iraq), thousands of years before the Greeks. 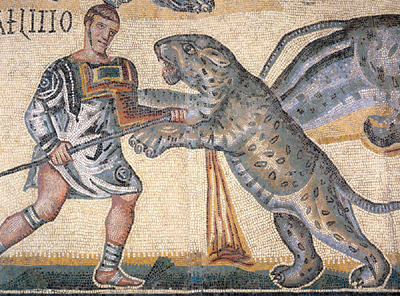 Roman artists developed mosaic making to a very high level of skill, and thousands of mosaics can be seen all over the Roman empire and in museums. 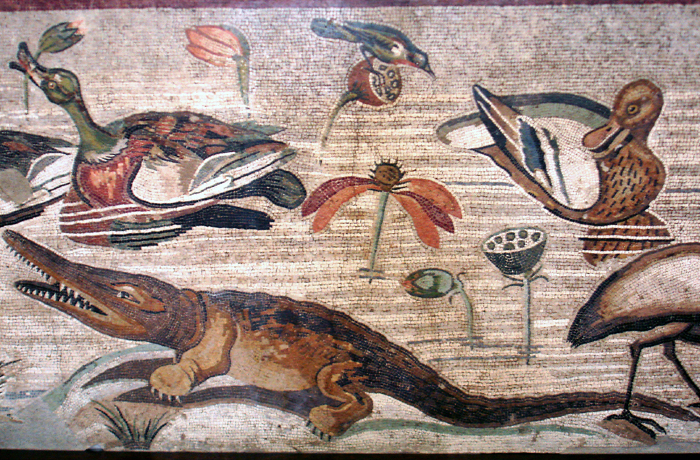 Mosaics were usually made to decorate floors and were made up of many small pieces of stone (or sometimes pottery), called tesserae (one is a tessera). 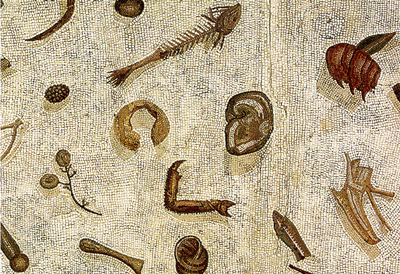 Tesserae were usually cubes of stones about a centimetre in size, and of different colours. If you look closely you can see that few are perfectly square; most are odd shapes with three or four sides. They were arranged by the artist to make a picture, and stuck down using cement. 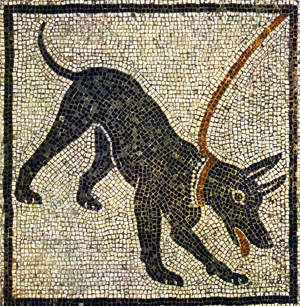 Later on, Roman mosaic makers used coloured glass tesserae, because this allowed them to use a wider range of colours to get subtle shading effects. 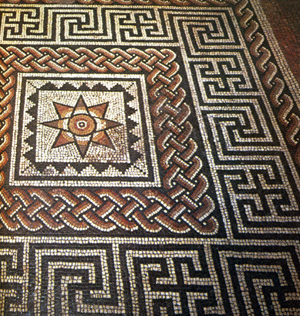 Mosaic making was very intricate and took a long time, so it must have been very expensive. This is why you see them in the villas (country houses) and town houses of rich people, but not in ordinary homes. 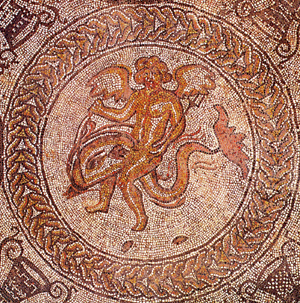 First the mosaic maker and the owner of the house had to agree on a design. As you can see from the pictures on this page, there are many types of design, such as geometric patterns (see above), animals and plants, scenes from mythology such as gods and strange creatures, and scenes from real life such as farming and gladiator fights. Next the artist would make a smooth, solid base for the mosaic, by spreading cement over a foundation of rubble. The outline of the design was sketched onto the cement as it started to harden. Then the craftsmen poured a mixture of lime and water over the cement. 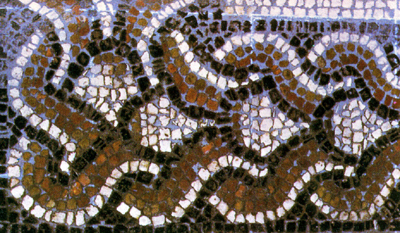 The tesserae were laid into this sticky stuff, following the design sketched on top. to make patterns. How many perfect squares do you see here? What sort of shapes are the tiles? 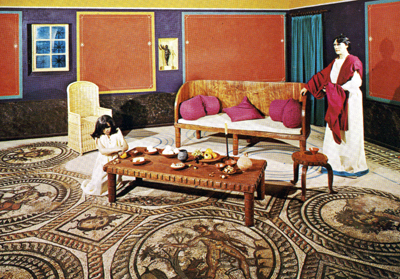 Reconstruction in the Museum of London showing how a mosaic would look in a living room. chi and rho, the first two letters in Christ. 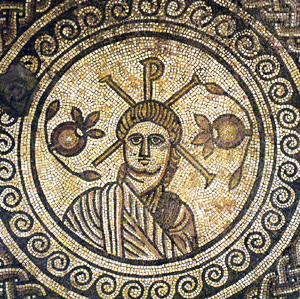 This was the symbol used by Christians before the cross. The Roman Empire became Christian around 400AD. Leftovers from a meal on the dining room floor - a very clever mosaic which even shows the shadows. What kinds of food do you see here? 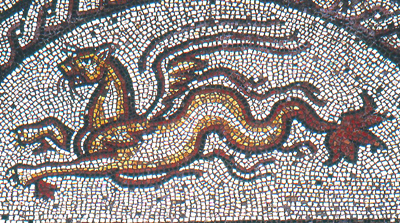 Mosaic showing the river Nile. What animals do you see here?